Star Wars Rebels - Farewell, Rebel Scum! Star Wars Rebels – Farewell, Rebel Scum! After four seasons, Star Wars Rebels bowed out in style. 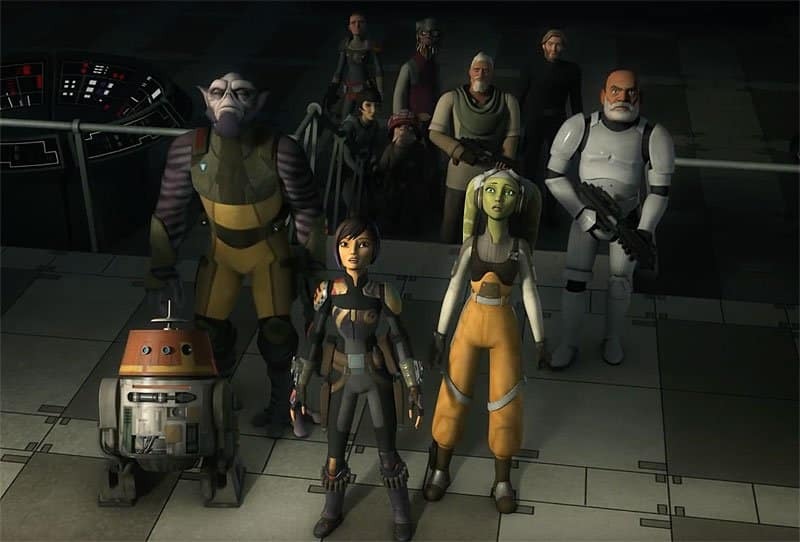 With the shocking loss of Kanan Jarrus/Caleb Dume still resonating amongst fans and the crew of the Ghost, it was up to the small band of heroes – Jedi apprentice Ezra Bridger, everyone’s favourite Mandalorian graffiti artist Sabine Wren, Lasat heavy-hitter Zeb, droid C1-10P (Chopper) and Captain Hera Syndulla – to defeat the might of the Imperial forces on Lothal. However, after all their adventures, they weren’t alone and had allies of all shapes, sizes and species everywhere. From pirates and old Clones to Loth-Wolves and Purrgil, it was a testament to the goodwill this small band of rebels had achieved just by helping others in need. Of course, their final battle wasn’t easy and didn’t come at a price. Ezra was forced to surrender in order to save the innocent people of his home planet, and was tempted to join the dark side by the Emperor; Zeb engaged in a life-or-death struggle with Rukh, a master assassin; Sabine was forced to choose between personal loss and the success of the mission; and the few remaining Clones embarked on one last mission to help the Jedi Order that they swore to defend during the Clone Wars. With Grand Admiral Thrawn set to destroy Lothal, personal sacrifice became the only way to win. Star Wars Rebels, when it first began, may have seemed like an unlikely tangent in the Star Wars universe at the time. After the gradual success of The Clone Wars series, which featured more fan-familiar favourites like Obi-Wan, Anakin Skywalker, Padme and Yoda, Rebels seemed to be in unfamiliar territory. Set several years before A New Hope, with an all-new cast of characters nobody had ever heard of and starting on a planet that held no significance to fans, it looked like a risky project. But, in keeping with Star Wars tradition, there was hope and it wasn’t as far removed from the mainstream series as it appeared on the surface. Two of the characters in particular, Zeb and Chopper, were based on the original concepts of Chewbacca and R2-D2 and retained much of the original spirit of their more famous counterparts. The music, inspired by John Wiliams’s classic work on the films, helped every scene resonate with the action, adventure and drama that fans have come to expect. While the characters may not have been the faces of the Rebel Alliance that fans knew and loved, the stories of the crew of the Ghost continually got bigger with increasingly high-risk stakes, and tied in elements of the films, books and the earlier Clone Wars series to great effect. And, just in case, there were cameos too. Appearances from Lando Calrissian, R2-D2, C-3PO and Princess Leia reminded us that the Rebels were indeed a part of the Star Wars universe. The return of Ahsoka Tano was a triumph that linked Rebels to The Clone Wars and gave fans the scene they always wanted as she finally confronted her former master, Darth Vader, voiced by James Earl Jones himself. Captain Rex and his Clone brothers also returned, continuing to prove their worth and reward the faith that fans had placed in them after some powerful character-building arcs in The Clone Wars too. Darth Maul came back to continue his own role in the saga, while Mon Mothma and Saw Gerrera debated the nature of the rebellion. The backstory of Wedge Antilles joining the Rebel Alliance was revealed. Grand Admiral Thrawn, a fan-favourite character from the books, finally appeared and was done justice. Even Obi-Wan and Yoda showed up again. Yet for all the cameos and returning characters, it was the Rebels themselves who did something special on screen: they had a natural chemistry as a group, evolved as characters, and they grew on the fans. They were the heart of the series. For Kanan and Hera, romance blossomed and the physical toll of the war against the Empire became obvious. For Ezra, he faced an internal battle against the Dark Side. Zeb reunited with some of his people, the survivors of the Empire’s plan of mass genocide. As for Chopper, he was the rude, ill-tempered and sarcastic droid who could always raise a laugh, showing so much attitude that he made R2-D2 look tame by comparison. 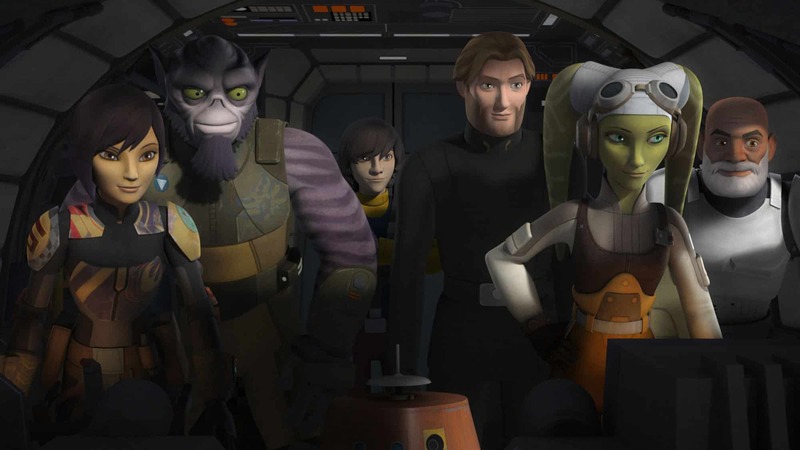 The Rebels might not have become household names but, for viewers, they more than earned their place in Star Wars lore throughout the course of the series. Before Rogue One and the new series of standalone films in the franchise, Star Wars Rebels proved that the Star Wars universe is bigger than the names Skywalker and Solo, and that the Millennium Falcon isn’t the only hunk of junk in the galaxy that can hold its own in a fight. It proved that it could be done, helping to pave the way for others. It embraced canon and went beyond it, exploring concepts and expanding on them, making it a series for the most dedicated fans. It even went so far as to give credit to a fan theory that Rex was the old rebel amongst the team disabling the power generator on Endor in Return Of The Jedi. Star Wars Rebels wasn’t just retelling the same old story, it was doing something more, something bigger. One of Ezra’s final statements in the last episode was that he wasn’t just scum, as the Empire is so fond of describing those who oppose it – he was Rebel scum, and proud of it. While the scenes afterwards were triumphant and offered even further hope, that moment summed up the show. It was its own unique creation and happy to be just that, fighting back against overwhelming odds and those who dismissed it. It was more than it first appeared, and the Force was strong with it. 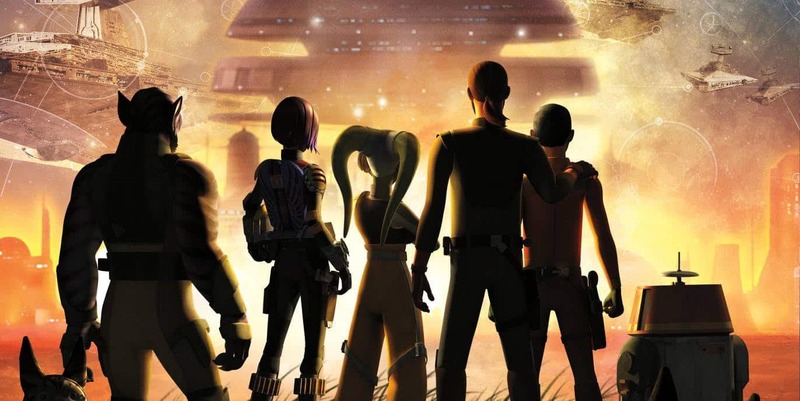 There’s a term which has become the new tagline for the films, but Star Wars Rebels earned it. It truly was A Star Wars Story. Thanks for this, good to know I am not alone. I truly enjoyed their story.